With advances in technology, video conferencing, CAD drawings, and file sharing, you could hire an architect from anywhere in the country or the world! But would someone from New York understand the character, values, and way of life in a neighborhood that borders Minnehaha Parkway? Would they know the nuances of a Saturday morning in Linden Hills? Probably not. But a local architect would. So, how do you find one? I could say you already have found the architect for your new home, addition, or renovation. Just Contact Chris to get started. But there are many qualified residential architects in the state, and the Minnesota Chapter of the American Institute of Architects website is a good place to start. On their website, you will find profiles of Minnesota architecture firms. This will give you a general idea of firm size and how much of their work is residential. It will also have a link to their website, which is a great place to see their work, approach, and the services they offer. After you narrow it down to those that interest you, it’s time to set up a few interviews and check them out in person. If you don’t want to search the web, you can also talk to architects at a Home Show. Home shows are a great opportunity to investigate all kinds of construction products, contractors, and architects. You will be able to talk with different residential architects, see examples of their work, and discuss the fees and services they provide, all under one roof. More importantly, it gives you an opportunity to gauge how you connect on a personal level and see if they are the right architect for you. There are over 200 architecture firms listed on the Minnesota AIA website, but not all of those firms specialize in residential architecture. There are firms that specialize in healthcare facilities, office buildings, education, churches, industrial, museums, recreational facilities, retail, and multi-family housing. Firms that focus primarily on any of the previous building types are not the right choice for you. First, their projects are much larger than yours; they are used to working with committees and boards rather than individuals. Moreover, they probably don’t have the experience you are looking for. Once you weed out the firms who do not specialize in residential architecture, you want to find a firm that has experience building the type of project that you are envisioning. If you are remodeling your home or adding on, an architect who focuses on new homes may not have the experience to make use of the assets that exist in your home, keep the current character, or make your addition look like it was always a part of your home. It is also important that the architect you select will be able to help you understand the costs and benefits of the direction you choose to pursue, whether it is to renovate, add on, or build new. To help you achieve your goals for your home project, you should select a residential architecture firm that can help you look past the limitations of your current home and see how you can reuse your existing space creatively. You need someone who can help you make the most of the space you currently have while taking advantage of the design opportunities that you were unable to see on your own. An architect who can help you redesign your current space without adding on or moving will save you money rather than cost you money in the end. 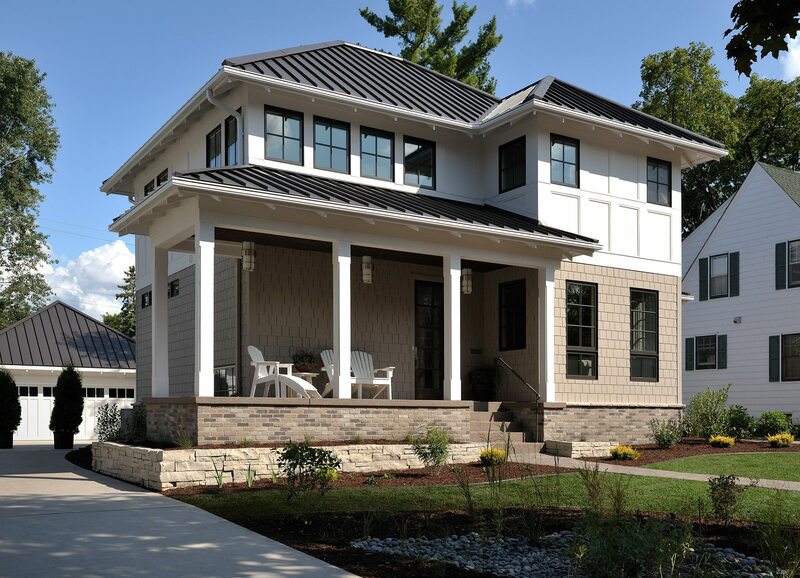 When building a new home in Minneapolis, the right architect can help you navigate the important choices you need to make to determine where and what you will build. When looking for a Minneapolis lot, you will need to choose from bare lots or existing homes that you will need to tear down before you build. The right residential architect will help to define your goals for your new home and can help you decide which option is best for you. Working with the right architect will help you design a home that compliments your lifestyle and reflects your personal tastes. In Minneapolis, homes are required to conform to very restrictive setbacks, floor area totals, impervious surface coverage, building coverage, minimum window area, and height restrictions. You are also required to follow a detailed list of design standards with a point system and a minimum number of points for building permit approval. To be successful, it is essential to have an interactive design process with your architect while getting feedback from the local planning and building departments. This approach allows you to move ahead with the design and construction of the project with confidence that you will achieve the desired outcome for both you and the neighborhood you have chosen to live in. These building restrictions and requirements are designed to encourage what only a skilled residential architect can give you. A new home, addition, or renovation that respects its neighbors and the neighborhood in which it resides while achieving all your goals for the project. If you are in a neighborhood with these types of restrictions, you may need variance to achieve what you want. An architect that has experience working with the local Planning and Zoning Department and the Building Department will be a huge boon if your project goals are outside of the norm. Not every residential project needs the same level of service. Deciding what level of service you need and the best architect to provide that service can be a challenge. Different firms have different philosophies on the services they provide. Some are flexible and will work with you and your builder to identify the detail you need in your construction drawing. Some firms offer only full-service options that include design, construction drawings, construction details and specifications, interior design, and construction observation. When interviewing potential residential architects, see if they are willing to work with you to provide the level of service you need. Are they flexible in their service offerings, or do they have a one-size-fits-all philosophy? Paying for services you do not need is not a good investment. However, not getting the services you need to ensure your builder constructs your project the way you want is a waste of time and money. How do you know what you need? That is a great question to ask someone you are thinking about hiring. If they are not able to walk you through the decision-making process to determine what service is right for you, they are probably not the right firm. Many residential architecture firms base their fees on a percentage of the construction cost. For example, if the price of lumber goes up during the design of your project, so do your architectural fees. You will have many things to consider during the design of your project, but paying extra architectural fees should not be one of them. Look for an architect who will fix their fees once the scope of your project is set. This will allow you to build the trust you need and focus on the project rather than the architectural fees. Also, remember that if you reduce the amount of involvement of your architect to save money on architectural fees, you will also give up some important benefits they can provide. Consider the construction details that you and your contractor will need to provide and all the decisions you will have to make before you consider fewer architectural services. Remember, you will spend most of your project costs on the construction. Make sure you have all the information and documents you need to ensure you are spending your construction dollars in the most effective way. Designing a home is a process that depends on effective communication between the homeowner and the architect. It is important to develop the kind of personal relationship with your architect that is necessary for them to understand your vision and to assist you in creating the home that is uniquely you. Look for an architect who will listen to what you want and is more interested in your style than their own. When it is all said and done, your architect will provide you with the documents you need to build your project and perhaps observe the construction process. But once the dust settles and your construction is done, you are the one who will wake up every morning and either love your home or not. An architect who thinks they know how you should live is not the right fit for you. Design should be a conversation where your architect finds out what is important to you and brings that to life. Another thing that many people fail to consider when selecting an architect is the X factor, the personal connection. Designing a home is a very personal experience. Not only will you spend a great deal of time with your architect, you will also share the intimate details your life: how you eat, sleep, entertain, relax, and play. Yes, your architect needs to know those things to make sure your home is designed to help you live the way you want. When you interview architects, ask yourself this question: Can I imagine sharing details of my life with this person? Do I like them? Does he or she really listen to me? Do they get me? Do I enjoy interacting with them, or is carrying on a conversation difficult? Any home construction project you undertake carries with it significant cost and potentially stressful situations. Your relationship with your architect should not be a source of stress. Your architect should be the person you trust to give you the answers you need and who will make the process fun and the results rewarding. If you’re ready to embark on the exciting journey of building or improving your home, then be sure to contact Chris Doehrmann Architect, Inc. We would be more than happy to meet with you and discuss what we can do to pull the vision of your perfect home out of your mind and into the world. ← 50th & France, Here We Come!